This is an environmentally and ethically friendly bag which is made from Organic and Certified Fairtrade cotton. It is a great option for a reusable, long lasting and good quality bag. They come in either a plain cotton which is available ex-stock. There are no minimums for plain bags. You can get your company logo or a catchy slogan printed on the bag for only a minimum of 200 bags. 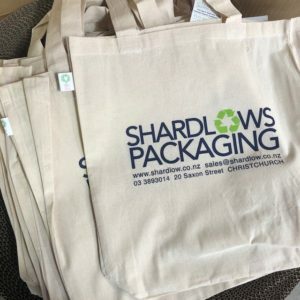 If you would like a price for custom printed bags, please email our customer service team your logo or idea and we can get a quote done for you. Fairtrade is about better prices, decent working conditions, local sustainability, and fair terms of trade for farmers and workers in the developing world. By requiring companies to pay sustainable prices (which must never fall lower than the market price). Fairtrade addresses the injustices of conventional trade, which traditionally discriminates against the poorest, weakest producers. It enables them to improve their position and have more control over their lives.